Don’t Give Your Consent to Slavery – Fight Fascism! O WHAT IS THAT SOUND? China is the Key to America’s problems. Don’t Give Your Consent to Slavery: Fight Fascism! What Is The Truth About ISIS? 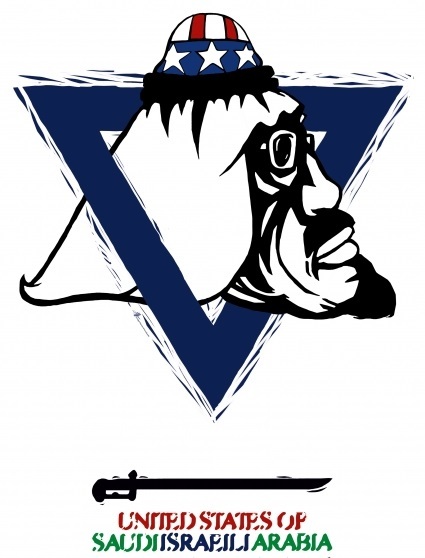 “We, the Saudi family are cousins of the Jews. “Hubris and mendacity” characterize the U.S. approach to rebuilding Afghanistan, according to the federal watchdog monitoring the $132 billion of taxpayers’ money allotted for reconstruction in the war-torn country since 2002. A damning new report by John Sopko, special inspector general for Afghan reconstruction, comes amid fresh hopes of a peace deal to end a conflict that has bedeviled successive U.S. presidents at a cost of more than 2,000 U.S. lives. Sopko warns that hopes of future security could be dashed if the world turns its back on the nation where American troops ousted the Taliban from power in 2001. And he said years of misguided U.S. policies meant that the risk of insecurity would likely remain long after any agreement. “Hubris was that we actually thought we could turn a country as poor as Afghanistan, as beaten up after 40 years of war, with every major infrastructure and every government institution destroyed — we had this hubris that we could come in and turn it into a little America,” he said. He added that it was very difficult to set about “nation building” in a country riven by factional rivalries, a weak central government and pockmarked by decades of war. Problems were exacerbated, he said, by public figures who offered an optimistic picture of progress. “And mendacity because we oversold it to the American taxpayer. We oversold our capability, we oversold the success,” he said. Sopko’s bleak assessment came with a list of eight threats to the country’s long-term stability: Widespread insecurity, the difficulty of disarming 60,000 Taliban fighters, underdeveloped police capacity, endemic corruption, a feeble economy, a booming trade in narcotics, threats to women’s rights, and weak oversight of foreign spending. Those risks underscore the difficulty facing Donald Trump as he looks to make good on a promise to bring home the remaining 14,000 U.S. troops in Afghanistan. Zalmay Khalilzad, Mr Trump’s special representative for Afghanistan reconciliation, recently embarked on a tour of Europe, the Middle East and South Asia to promote fresh peace talks. Washington (AFP) – A Russian military deployment to Venezuela that has prompted warnings by the United States was meant largely to fix a broken missile system, a US official said Friday. “One of the things they are doing seems to be, and we have thought this from the very beginning, helping the regime with the S-300 ground-to-air missile system which apparently got all screwed up… by the blackout,” Abrams told reporters. The S-300 is a major missile defense program designed to shoot down aircraft and other missiles that was designed by the Soviet Union. Russian official media in 2012 reported an S-300 shipment to Venezuela. The economically crumbling country this week suffered its second nationwide blackout this month, knocking out transport, water supplies and communications and paralyzing the crucial oil sector. “Maduro will only use this military support to further repress the people of Venezuela; perpetuate the economic crisis that has destroyed Venezuela’s economy; and endanger regional stability,” Bolton said in a statement. US President Donald Trump earlier called on Russia to “get out” of Venezuela. Russia has said that its forces, which it described as military experts providing technical help, will stay “for as long as needed,” calling the US effort in Venezuela an attempted coup. 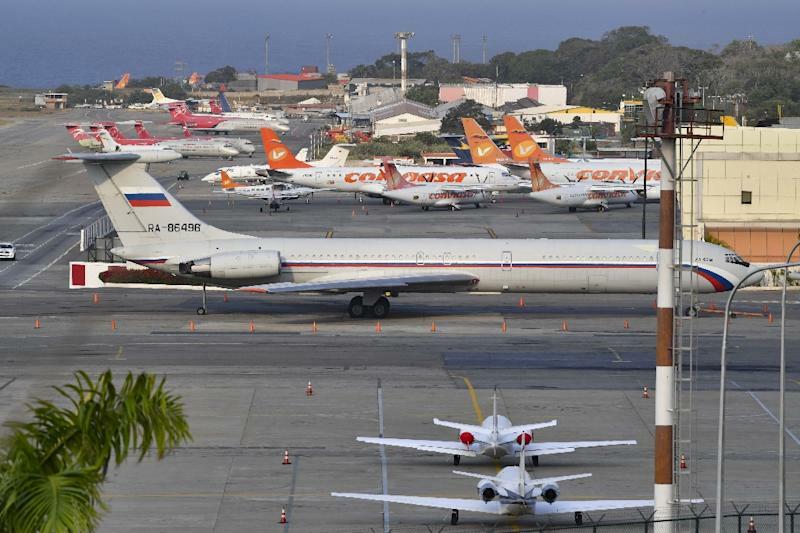 Two Russian military planes landed at the main airport outside Caracas on Saturday and offloaded the equipment and troops. Secretary of State Mike Pompeo soon afterward raised objections in a phone call with Russian Foreign Minister Sergei Lavrov. The United States and 50 other countries say that the leftist firebrand Maduro is no longer the legitimate leader of Venezuela and have recognized opposition leader Juan Guaido as interim president. As the annual AIPAC conference wraps up in Washington on Tuesday, historian Walter Hixson looked back on the Israel Lobby’s origins in this speech last Friday to the “Israel Lobby & American Policy Conference” at the National Press Club. This conference speaks truth to power. We gather here because we support truth and justice in Palestine. We also insist on a free and open discussion of the Israel lobby and its impact on American democracy and world politics. All of you already know that the Israel lobby is extremely powerful—for the record, it constitutes easily the most powerful diaspora lobby representing the interests of a foreign nation in all of American history—but you may not know how deeply rooted it is. In fact, the extensive lobbying efforts of Zionists and their Jewish and Christian sympathizers in the United States predate the creation of Israel and flourished throughout the first generation of the Palestine conflict. 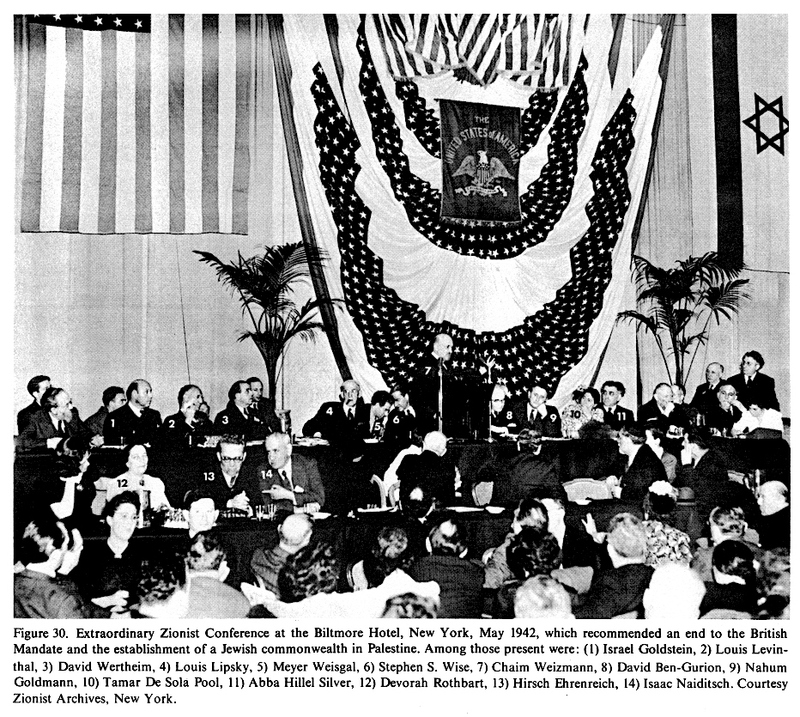 As good a date as any to fix the origins of the Israel lobby in the United States is the 1942 Biltmore Conference held in the heartland of American Zionism, New York City. Zionists quickly discovered that they could mobilize Jewish organizations as well as groups such as the American Christian Palestine Committee, to pressure Congress to back the cause. The nascent lobby efficiently lined up the two main political parties in support of creation of a Jewish commonwealth, admission of masses of refugees, and crucial US financial assistance to accommodate them. Military assistance would come later. A well-organized and effective Zionist lobby thus pre-dated the creation of Israel. It was poised to ensure that Israel would receive the diplomatic, political, and military support that would enable it to undertake decades of aggressive expansion in direct violation of myriad UN resolutions, principles of human rights, and international law. From the beginning the purpose of the lobby was to insulate the Zionist state from widespread criticism, to deflect and distort the truth about its aggression, so that it could reap the benefits of security and massive financial assistance from the most powerful country in the world. Louis Lipsky, an American Zionist from Rochester, declared that propaganda and persuasion would provide “the armor that Israel cannot live without.” The key figure in the first generation of the lobby, however, was a little-known Zionist from Cleveland, Isaiah Leo Kenen. Working hand in hand with the Israeli diplomat Abba Eban, Kenen became the workhorse of the Israel lobby. His personal papers, available at the Center for Jewish History in New York yet largely neglected by scholars, reveal the early history of the lobby. Those and myriad other papers, along with State Department records and an abundant secondary literature, provide the research foundation for the book that I have done. The Palestinians and the Arab world had no comparable lobby in the United States, which had the largest Jewish population in the world and millions of modernist and fundamentalist Protestants ready to line up behind the Jewish refugees in Palestine. Full awareness of the horrors of the Nazi genocide, combined with ignorance of the impact of Zionist aggression in Palestine, underlay US public support. Buoyed by the growing U.S. support, Israel expanded its borders, rejected international mediation, and turned a blind eye to the plight of hundreds of thousands of Palestinian refugees. When the UN mediator Count Folke Bernadotte of Sweden pressured Israel to compromise, a terrorist troika that included future Israeli prime minister Yitzhak Shamir had him gunned down in his jeep at a Jerusalem roadblock in September 1948. By that time, with a presidential election looming in November, the lobby exercised a powerful influence over the Truman administration. Zionists worked through David Niles, a White House adviser on Jewish affairs, which became an essential post in presidential administrations. Israeli patriarch Chaim Weizmann assiduously cultivated Truman with the help of the president’s former business partner, Eddie Jacobson, a Zionist from Kansas City. Fully aware and frequently resentful of the pressure exerted on him by the Israel lobby, Truman nonetheless ultimately sided with it and against the advice of the State Department. The United States became the first nation to recognize Israel, supported a massive influx of Jewish migrants, and glossed the ethnic cleansing of Palestine. President Eisenhower and Secretary of State John Foster Dulles presented a greater challenge for Israel and the lobby than had Truman. The Republican administration entered office in 1953 determined to rein in Israel and forge a Middle East peace that would protect oil supplies, allow Arab moderates to fend off extremists, and support the overarching foreign policy of containment of communism. 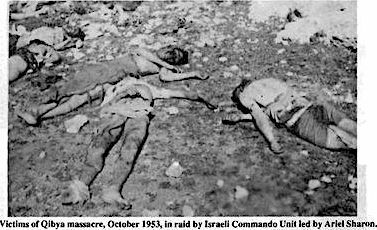 Israel appeared vulnerable when Ariel Sharon manifested a lifelong zeal for indiscriminate slaughter of vulnerable Arab people, as he orchestrated a massacre in the West Bank village of Qibya in October 1953. Deeply alarmed by the impact the massacre might have on American public opinion, Kenen mobilized the local councils to calm the waters in the wake of the indiscriminate killing of innocent villagers in their homes. Kenen soon realized that the political power of the lobby already was so well ensconced that representatives and senators of both political parties could be counted on to line up behind Israel in a crisis. This was an important moment, as Qibya showed thatIsrael could massacre people and rely on the lobby to effectively manage the political fallout. Israel thus could continue to lash out violently across the already expanded borders, regularly carrying out assaults disproportionate to any provocation in Jordan, Syria, Egypt and Lebanon. In 1957 Eisenhower did force Israel to pull back after it had invaded Egypt, but even then, Israeli aggression was rewarded with critical new navigation rights that would enable it to precipitate the pivotal June 1967 War. In the period between Suez and the 1967 war, John F. Kennedy won election backed by overwhelming Jewish political support. In 1962 JFK pronounced the existence of the “special relationship” and opened the military supply spigot by selling Israel Hawk surface to air missiles. The Israelis showed their appreciation to Kennedy by repeatedly lying to him about the nuclear research program in the desert at Dimona. They pledged not to introduce nuclear weapons to the Middle East when in fact they were committed to doing precisely that. Israel refused to sign the Nonproliferation Treaty. Iran, by contrast, like the overwhelming majority of nations in the world, is a signatory. By the Kennedy years the lobby had reorganized several times and established its structural component, AIPAC, backed by influential supporters in both political parties. Kenen regularly stuffed congressional mailboxes with copies of the Near East Report, the well-edited and highly successful propaganda newsletter that he created. Inside the White House, the Jewish affairs adviser Myer “Mike” Feldman undermined efforts to rein in Israel. The lobby ensured that the State Department and the few members of Congress who asked troublesome questions—notably Senator J. William Fulbright—were kept at bay. The lobby then targeted and in 1974 helped defeat Fulbright and drive him out of the Senate. Noting that the Kennedy administration was virtually powerless against Israel and the lobby, adviser Robert Komer, himself Jewish, asked in frustration, “What kind of relationship was this?” To Komer and the State Department diplomats it was obvious that Israel and the lobby were the tail that wagged the strategic dog of American Middle East policy. In his blurb for my book, John Mearsheimer wrote that it is “especially good at showing how a select group of pro-Israel Americans profoundly influenced President Lyndon Johnson, who was like putty in their hands.” Johnson had been pro-Israel since his youth when his Aunt Jessie infused him with the biblical lore that God had chosen the Jews to inherit the holy land. Johnson also enjoyed the company of close Jewish friends and advisers—Eppie Evron, Abe Fortas, Arthur Goldberg, Arthur and Mathilde Krim, among others. Johnson apparently did not directly green light Israel’s initiation of the June 1967 War, but neither did he flash a red signal. As several Israeli leaders subsequently openly acknowledged, Israel in 1967 as in 1956 launched the June war as a first rather than a last resort. The Israelis as well as the CIA knew that Israel was the more powerful force, could defeat all of its Arab rivals combined, and that is precisely what Israel did, initiating a blitzkrieg attack rather than seeking a negotiated settlement of maritime and territorial disputes. After the war–which included the apparently deliberate attempt to sink an American spy ship, the USS Liberty, killing 34 and wounding 171 US sailors–Johnson reversed a generation of US policy upholding the 1949 borders. He acquiesced to the lobby in support of an occupation of Arab territories that extended in myriad directions far beyond the 1949 armistice lines. The lobby thus enabled Israel to exploit the sweeping military triumph by embarking on a messianic quest for the Greater Israel. My study culminates with the pivotal decisions in 1967 initiating an illegal occupation and the emergence of a violently regressive apartheid state. Before most Americans even knew that it existed the lobby had played a pivotal role in enabling Israel to launch an aggressive war, to choose land over peace with the Palestinians and its other Arab neighbors, and to continue to thumb its nose at the UN and international law. The United States not only enabled the illegal occupation, it bolstered the IDF with advanced weaponry including tanks and F-4 Phantom jets despite Israel’s contempt for the nuclear non-proliferation treaty. USS Liberty after the attack. The lobby achieved its success by circumventing the foreign policy bureaucracy and applying pressure directly on the president and the Congress through campaigns to secure financial assistance, armaments, and unstinting diplomatic support for Israel. By the 1970s the lobby and Kenen himself began to be identified and chronicled by the press. 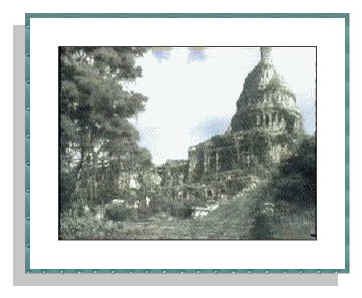 Asked in 1973 to explain the operations of the lobby, Kenen responded, “I put it very succinctly in one sentence, ‘We appeal to local leadership to write or telegraph or telephone their Congressmen and urge them to call upon the President to overrule the Department of State,’ and this has been going on, now for some 20 years.” At the time of the interview the Near East Report had achieved a circulation of nearly 30,000. As Kenen suggested, and as my book shows, throughout the first generation of its existence, from the Truman through the Johnson years the lobby successfully fended off persistent State Department efforts to forge an “impartial” or “balanced” diplomacy between Israel and the Arabs. While Israel carried out cross-border attacks, stonewalled refugees, and rejected diplomacy, the lobby successfully undermined the advice of area experts who warned that the imbalanced, pro-Israeli policy would perpetuate instability and achieve security for no one, including Israel. American professional diplomats, often wrongly dismissed as pro-Arab or even anti-Semitic, neither of which was true, warned about the consequences, including the rise of extremism in the Arab world. Their prophecy would come full circle in the twenty-first century. I turn now to a broader interpretive study I have undertaken on a history of the U.S.-Israeli special relationship. When I began intensive study of Israel-Palestine several years ago, I was susceptible to the familiar stereotypes: age-old religious conflict, ancient enmities, neither side will compromise, etc., etc. Now that I know better, I am of course charged with being one-sided, so let me say this: Palestinians and Arabs are human and have made many mistakes, to be sure. The historical record clearly shows, however, that the Palestine conflict is rooted in Zionist aggression. Accelerating settler colonization has both caused and perpetuated the conflict and moreover has foreclosed genuine opportunities for a peace settlement–in 1949, even more clearly in 1967, and in the 1990s as well. In everyday life we learn that it is inappropriate to blame the victim. The same is true in diplomatic history; no one blames Poland for being invaded in 1939. Accordingly, the focus in what follows is where it belongs, on the aggressors and their apologists. Today Israel and its American backers have become increasingly transparent in their regressive policies, claiming Jerusalem as the “eternal capital,” savagely cutting off Gaza as well as aid to the Palestinian refugees, engaging in targeted killings and collective punishment, and now the United States has signed off on another illegitimate annexation, this of the Syrian Golan Heights. All of these actions are in direct violation of international law. We may not be able to stop these actions at this moment in time, but what we can do as scholars and activists is call to account Israel and the United States for their crimes against humanity. Specifically, we must gain a clearer understanding of Israel’s core identity, and the ways in which the lobby acts to cover up Israel’s crimes. Application of the framework of settler colonialism to explain Israeli history has been a step in the right direction, but what does this label really mean? Here is a brief overview: Animated bynationalist and religious discourses, settler states such as Israel, the United States, Australia and South Africa, among others, are congenitally aggressive. They strive to cleanse the land of its indigenous residents in the name of providential destiny, modernity, and racial hierarchy. Settler colonial states work relentlessly to establish facts on the ground. They embrace violent solutions including regular resort to massacre. They reject legal restraints and they abhor external authority. The Israeli political system has empowered a series of bigoted, bellicose leaders who showed utter contempt for Arabs and a determination violently to dispossess them. The early Zionist leaders bore the psychic scars and traumas of the bloodlands of east-central Europe from which they came. They carried the terrible burden of the Nazi genocide that took the lives of their family members and some six million Jews. As a result, they were quick to brand Arab leaders like Nasser as the next Hitler; diplomacy became a reprise of Munich; any effort at compromise was dismissed as appeasement. This time, they vowed, the Jews would be the aggressors. The Israeli leaders thus inherited, internalized, and perpetuated an intolerant, Hobbesian worldview that was inimical to peacemaking. For most of its existence Israel has been led by men who should be held accountable for war crimes. I do not make such an accusation lightly; abundant evidence exists under international law to make the case against, at a minimum, Ben-Gurion, Dayan, Begin, Sharon, Shamir, and Netanyahu. They must be held to account in the dock of history if nowhere else. Millions of decent, caring people live in Israel. Some of them bear a heavy burden of regret and frustration over their country’s actions, as do many of us with respect to American policies both at home and abroad. The crucial point, however, is that neither peace-minded Israeli citizens nor liberal American Jews have thus far been unable to break through the iron wall of Israel’s militant chauvinism or to unhinge the right-wing vice grip on political power. The conclusion seems inescapable: the militant and messianic settler state selects like-minded leaders. It is essential to come to grips with the militancy at the core of Israel’s identity in order to understand the role of the Israel lobby. The lobby provides cover for Israel’s congenital aggression, its pursuit of land over peace, its flaunting of international law. While Israel carries out violent and criminal acts, the lobby functions to insulate it from criticism, to distort history and reality, in sum to provide what Lipsky described, the armor that Israel cannot live without. Such is the hubris of imperial settler states like Israel and the United States that even as they engage in violent repression, they simultaneously insist on being loved, honored, and accredited as model democracies. Historical denial and policing of dissent are thus among the primary characteristics of the militant settler state. Efforts to unpack Israeli or for that matter American mythology and to expose the aggression that inheres within, are invariably attacked as subversive. For Israel, like the Soviet Union of old, glasnost could become a deadly virus. For these reasons Israel and the lobby smear and condemn their critics unmercifully. Which brings us to the recent remarkable, deeply disturbing, and yet highly revealing case of Rep. Ilhan Omar. Rep. Omar may have been guilty of hitting the send button on some loosely worded tweets—clearly as rare and heinous a crime as there is in America today. 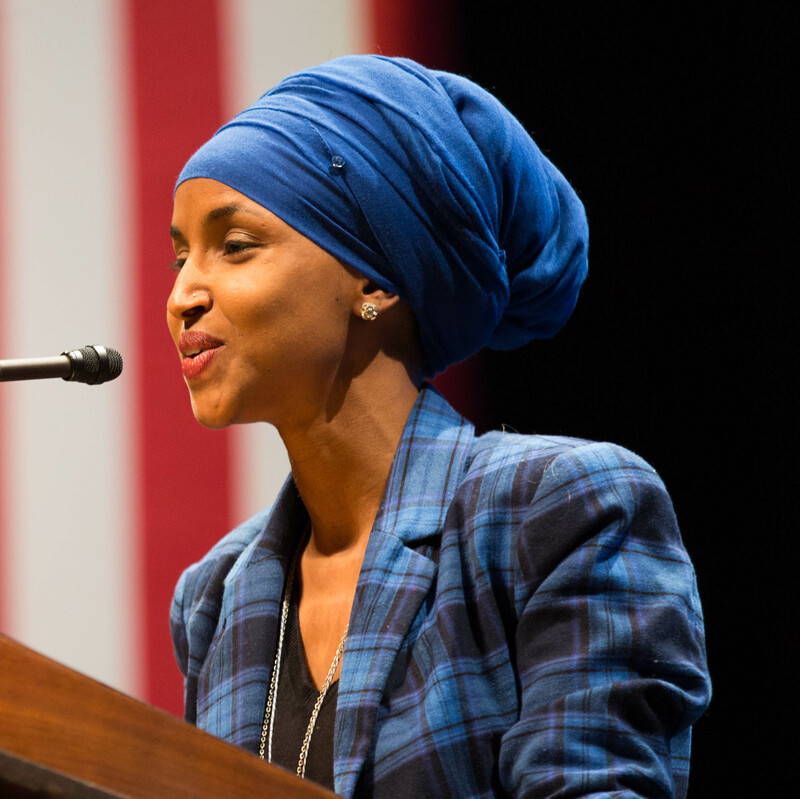 Israel’s apologists attacked Rep. Omar for linking “Benjamins” with the Israel lobby; that is for having the temerity to suggest that a politicallobbyin a capitalist society might raise and use moneyin an effort to shape public opinion and the resultant national security policy. This, of course, is precisely what the Israel lobby doesdo. Nonetheless, Rep. Omar apologized for the tweet, showing a degree of states-woman-ship that you may never see nor hear from the Israel lobby. Think about all of the people that CAMERA and other Zionist attack groups have smeared over the years? Have you ever known themto apologize? Israel’s vocal partisans in Congress, backed by the lobby, stepped up the Orwellian assault on Rep. Omar when she stated another rather obvious truth, namely that the lobby demands political allegiance to the state of Israel. So, we have a situation in which a lobby was created for the express purposeof promoting uncritical bipartisan support for Israel, yet when a member of Congress dares to point this out, she is viciously attacked and inundated with death threats. Derrida and Foucault would no doubt be gratified that the Israel lobby has mastered the concept of tropes, as well as the ability to use them to manipulate an all too easily confused, Internet-addled mass society. Tropes, as the French theorists taught us, are deployed for the purpose of exercising power. While Rep. Omar herself never used the term “dual loyalty,” her critics unleashed this particular trope as if she had. She was then promptly saddled with the scarlet letter of anti-Semitism. Unreflective journalists including the so-called liberal news media jumped on the bandwagon, affirming and spreading the word to the point that a canard effectively became the “truth,” namely that Omar had trafficked in anti-Semitic discourse. What she had done in actuality was attempt to criticize Israel and illuminate the role of the lobby. These are the reasons that she had to be smeared and silenced. 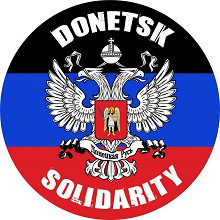 Smears and distortion undermine free speech and dissent in a supposedly democratic society, but even worse in this case they cheapen and detract from the chilling reality of actualanti-Semitism, the hate-filled stereotypes and violent attacks such as Charlottesville and especially the massacre at the Pittsburgh synagogue in October of last year. Let’s consider another trope: “Islamic terrorism.” In the United States, in Israel, and other countries you are free to use this trope at will. It is perfectly acceptable to link the world’s second largest religious tradition, with millions of adherents in scores of countries all over the globe, with terrorism. If you say “Islamic terrorism,” there will be no lobby, no trope police to step in with smears and vilification. You are thus free to inspire people to take action, like the mass murders last week in the New Zealand mosque. If you apply “Axis of evil” or “evil-doers” to Islamic countries, that is well and good. However, if you are a non-white, Islamic-congresswoman who wears a headscarf, and you condemn as “evil” Israeli war crimes killing innocent civilians in the Gaza strip, you are branded an anti-Semite. The smearing of Omar calls to mind the remark Netanyahu once made, unaware that he was being recorded, about how easy it was to manipulate discourse and to move public opinion in the United States. It also lays bare the cynical tactics of the Israel lobby. 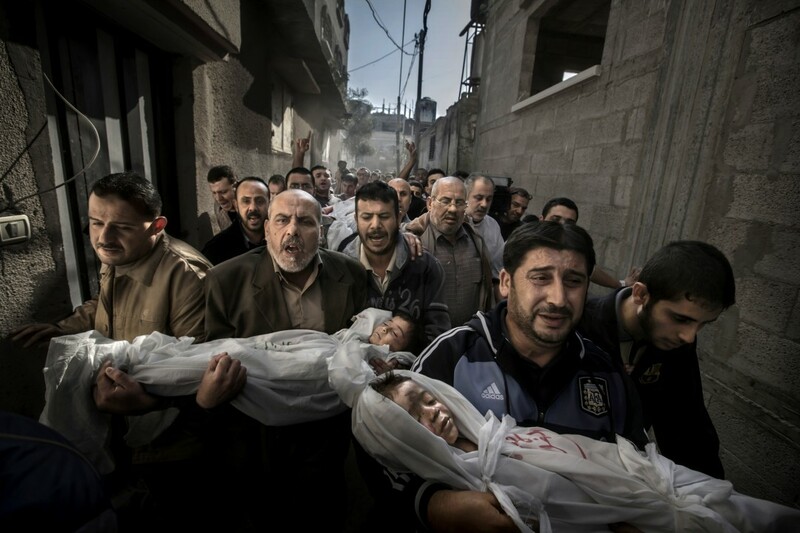 From Qibya to the killing fields of Gaza, Israel and the lobby have discovered that a tenacious and relentless propaganda campaign can cover up almost any crime, justify almost any calumny, overcome almost any political challenge. Israel and the lobby have learned to mobilize fast, to attack without restraint, to eliminate perceived threats, and ultimately to turn them to their own advantage. Israeli propaganda thus mirrors Israeli military power: both deploy campaigns of shock and awe, allowing the bodies fall where they may, ever willing to make truth the first casualty. As I bring this talk to a close, bear with me while I engage in a final bit of historical reflection. We live in dangerous times. The distortions and deep divisions within this country sometimes remind me of the antebellum years of American history. Ominously, it was a time when the political system collapsed. It was true of the United States in 1858 and it is true of Israel/Palestine today. Something, somewhere, somehow, sometime is going to have to give. In 1861 Abraham Lincoln went on to become president. He famously wore a top hot, which reposes in the Smithsonian just a few blocks from where I stand today. Encircling Lincoln’s top hat is a black silk mourning band through which he honored the memory of his son Willie, who died prematurely at age 11. I hate to think what Henry Adams might say today. Let me conclude in the same spirit. Let us declare here today that if demanding the right to exist while denying it to your neighbor is not wrong, nothing is wrong. If driving people from their land and demolishing their homes is not wrong, nothing is wrong. If asserting absolute authority over a historic city, rightful home to people of all faiths, is not wrong, nothing is wrong. If slaughtering children for throwing stones at their oppressors is not wrong, nothing is wrong. If the terror and deprivation that are inflicted every day upon the imprisoned people of Gaza is not wrong, nothing is wrong. If supplying more than $125 billion to finance a regime that commits such crimes against humanity is not wrong, nothing is wrong. If converting the Congress of the United States into a lapdog for Israeli policies is not wrong, nothing is wrong. Let us also emphasize once again that if anti-Semitism is not wrong, nothing is wrong. Cynical deployment of baseless charges of anti-Semitism, however, in order to legislate against free speech; stifle criticism of a foreign nation; or insist on the right to boycott an apartheid state–if these things are not wrong, nothing is wrong. Speech on March 22, 2019, at the National Press Club, Washington, D.C.
Walter Hixson is distinguished professor of history at the University of Akron. He is author of the just-released Israel’s Armor: The Israel Lobby and the First Generation of the Palestine Conflict (Cambridge University Press). He gave this talk at the “Israel Lobby & American Policy Conference” on March 22, 2019. Two days ago, there was an Israeli military incursion into Gaza. An assassination squad crossed the border into southern Gaza in a disguised vehicle, to murder a resistance Hamas leader. They were detected just as they managed to hit their intended target. The firefight that erupted while the murderers were trying to escape back across the border into Israel resulted in many casualties. One Israeli officer was killed and two others were injured. On the Palestinian side, there were seven deaths and about the same number of injuries. To guarantee a secure retreat, the Israeli assassination squad enlisted help from their air force, which proceeded to fiercely bomb targets in Gaza. The Palestinian resistance retaliated with volleys of rockets on neighbouring Israeli targets. All this was sparked by blatant Israeli provocation, which could have escalated into a full-scale war. The region is so volatile that any spark could cause a devastating explosion; the last thing any party in our region can afford, Israel in particular. Israel’s track record consists of countless assassinations of Palestinian targets around the world, as well as cross-border raids into neighbouring countries. 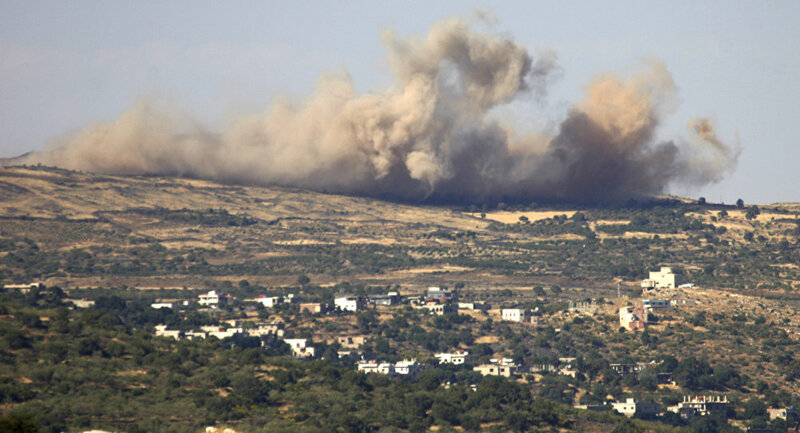 In the past few years, Israeli raids on Syrian targets have been routine. No blame has ever been placed on Israel for violating international law in committing such aggression, or even when openly threatening more aggression. No one blames Israeli fighter planes for violating Lebanese airspace on their way to Syrian targets. Israel took advantage of the fact that the Syrian government was in no position to retaliate in view of the situation in the country. It is necessary to ask what such aggressive raids have achieved, other than deepening the hatred and the hostility to a level that no amount of future reconciliation, once that may happen, would be able to heal. In this case, why should we consider this raid on Gaza to be a surprise, or an exception to the norm? In fact, it is neither. Israel did not deny this recent botched covert military operation in Gaza; it just denied that the purpose was the assassination of the Hamas leader. It was an intelligence collection mission that “went awry”, the Israelis said, even after the assassination had taken place. What is very odd about the timing of this attack, however, is that it happened just as Egyptian efforts to broker an open-ended truce between Gaza and Israel were about to reach a positive conclusion. Despite the huge contrast between the two situations in Gaza and in Israel, which falls clearly in Israel’s favour in every possible aspect, Israel needed the truce as much as Gaza did. Israel is not under siege as Gaza is and Gaza’s resistance forces are no match for Israel’s military might, and yet, Israel still needed assistance from the Egyptians to reach a state of calm. Had it not been initiated by Israel, this reckless assassination adventure into Gaza would have been seen as an attempt to sabotage the Egyptian truce effort. It appears, therefore, that Israel is prepared and willing to sabotage its own schemes. Israel complains incessantly that it is threatened by surrounding enemies: It crows about peace and constantly claims that all it seeks is to live in peace with its neighbours. Towards that claim Israeli leaders have demonised the Palestinians as terrorists and any effort on their part to reject the siege or the occupation, however peaceful, is deemed as blatant terror. The common formula in most of the grovelling Western media is that Israel’s aggression is always seen as justified self-defence; while real acts of legitimate Palestinian self-defence are routinely condemned as acts of terror. For years, “peace loving Israel” has been fiercely trying to instigate a war on Iran. Its efforts in this direction remain in full force with its relentless attempts to recruit allies and sponsors. Israel’s hand in all previous wars in the region cannot be denied, particularly the disastrous US-led war on Iraq in 2003. Unfortunately, much of the world submits to Israel’s aggression, with no serious efforts to demand accountability for its constant violations of international law, despite the fact that in this region, and perhaps further afield, no peace, no political stability and no normal life can ever prevail while Israeli aggression remains unchecked. Apocalypse Now & Loving It! Remember the madcap scene in ‘Apocalypse Now’, the 1979 film by Francis Ford Coppola about American genocidal rampaging in Vietnam? “I love the smell of napalm in the morning”, bellows the psychotic military commander as US choppers strafe and destroy a Vietnamese village. The same kind of unhinged death-wishing is reminiscent in the Trump administration. President Trump is on an infernal roll and his twisted supporters are loving it. His military forces are reportedly killing civilians in air strikes simultaneously in four countries — Afghanistan, Somalia, Syria and Yemen; his officials are openly bragging about fomenting regime change in Venezuela; and now in the latest madcap dash for depredation, Trump is backing the illegal annexation of the Golan Heights captured by Israel 52 years ago in the Six Day War. 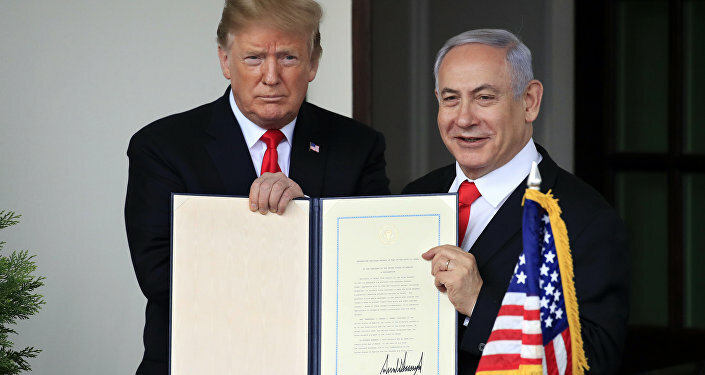 Trump’s Decision on Golan Heights: Well-Intended Move to Help Netanyahu Win Israeli Elections? And to make all this mayhem even more horrific, Trump’s cabinet and many of his supporters are convincedthat he is on a “mission from God”.In a recent media interview, US Secretary of State Mike Pompeo said his evangelical Christian beliefs make him view President Trump as a chosen instrument of the almighty. Why? Because, in Pompeo’s view, Trump is fulfilling an apocalyptic biblical prophesy held by many evangelical Christians. This prophesy contends that Israel will be the scene for Jesus returning to Earth, bringing about Judgement Day and the end of the world, when all “good Christians” like Pompeo will ascend to heaven in glory. It’s not just Pompeo who indulges this “vision”. Vice President Mike Pence and several other members of Trump’s White House are reportedly of the same evangelical conviction. They are sometimes referred to Zionist Christians because their vision of divine glory is intertwined with the restoration of the “kingdom of Israel” as in reputed biblical times. That’s why Trump’s fawning over Israel — from the declaration of Jerusalem as its capital, to the ditching of the Iran nuclear accord, to the latest announcement on the Golan Heights — has been cheered on at every step of the way. That’s what makes the present White House a truly frightening entity. It doesn’t just believe in its own self-righteousness — as with many other past US administrations. Team Trump actually want more conflict and mayhem in the name of “Israelite Glory” in order to fulfill their religious fantasies of divine redemption on Earth.This week, Russia and a host of other countries, including all Arab nations, even notably American client regimes like Saudi Arabia, warned that Trump’s unprecedented recognition of Syria’s Golan Heights as Israeli territory will unleash new waves of conflict across the Middle East. But such warnings will mean nothing to the Trump administration because it believes it is on a “mission from God”. There are plenty of other mundane explanations for Trump’s kowtowing to Israel without bringing God into the equation. Multi-million-dollar donations from superrich Zionist Jewish-Americans like Sheldon Adelson are part of it. So too are well-documented American oil interests in the Golan Heights. And Trump’s re-election hopes for 2020 depend on keeping his evangelical Christian voter base happy-clappy and singing Alleluias all the way to the polling booths. The irony is that while US news media and politicians have desperately sought to prove that “Russian collusion” was not an illusion, the stark reality is that the Trump administration has been openly, shamelessly colluding with the foreign state of Israel, pandering to all its despotism against Palestinian rights and warmongering towards Iran. The US news media and politicians don’t even see that outrageous in-your-face “malign influence” — and the few who do speak out like Congresswoman Ilhan Omar are vilifiedmercilessly as “anti-Semitic”. American imperialism has always been a particularly vile global scourge due to its “exceptionalism” and self-righteous propaganda. But the Trump administration has taken the obscenity to new depraved lows. When murdering children around the world with air strikes, starving countries into submission, and blessing the outright theft of foreign land is hailed as “God’s work” then you know there is something apocalyptic in the air. But not the kind of apocalypse that Trump’s Christian zealots cheer as a glorious event.Judgement Day of a kind is already here. Indeed, has been for quite a while. That judgement by the rest of the world who remain sane and retain basic moral goodness is that the United States is a diabolical rogue regime threatening the existence of the entire planet. The Assad regime army on Wednesday intercepted several missiles that were fired by Israeli jets during raids on an industrial zone in the northern city of Aleppo with damage to materials only, state television said. “The Israeli aggression targeted some positions in Sheikh Najar industrial zone and a number of enemy missiles were brought down,” an army statement said. Military experts say Aleppo is one of the main areas where Iran’s elite Revolutionary Guards have a strong military presence where it supports local militias that have for years been fighting alongside the Syrian regime. The Syrian Observatory for Human Rights, meanwhile, said that at least seven militia fighters loyal to Iran were killed in the Israeli strikes that targeted an arms depot on the outskirts of Aleppo. Initially, the U.K.-based watchdog said at least four people were killed in the attack. Israel, which considers Iran as its biggest threat, has repeatedly attacked Iranian targets in Syria and those of allied militia, including Lebanon’s Hezbollah. Prime Minister Benjamin Netanyahu has said Israel had carried out “hundreds” of attacks over the past few years of Syria’s war to curtail Iran and its ally Hezbollah. With an election approaching, Israel’s government has increased its attacks in Syria and has also taken a tougher stance towards Hezbollah on the border with Lebanon. 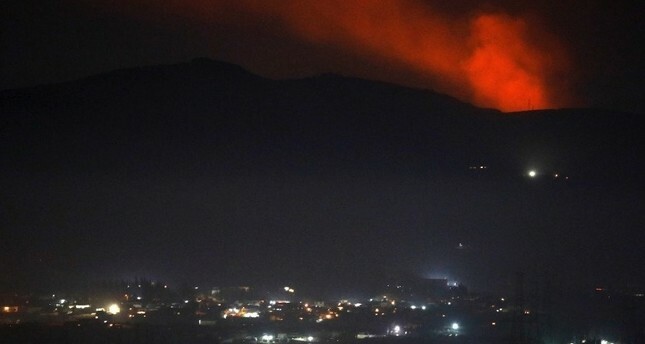 The incident comes amid high tension between Syria and Israel, after U.S. President Donald Trump on Monday recognized the Golan Heights as Israeli territory, a flagrant violation of international law. The U.N. Security Council was due to meet on Wednesday after Syria requested the international body discuss the U.S. proclamation. 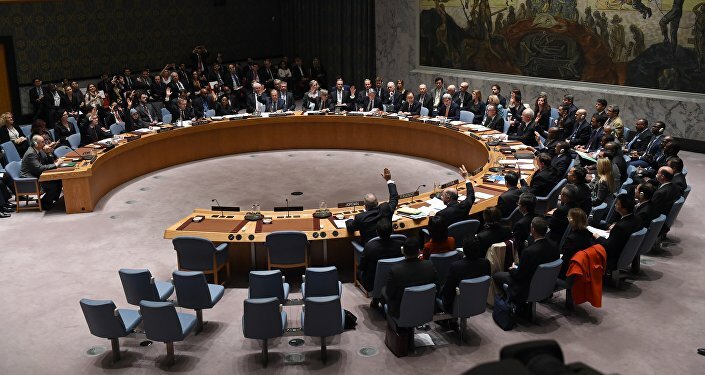 Three Security Council resolutions call on Israel to withdraw from the Golan, which it seized from Syria in the 1967 Six-Day War and annexed in 1981, in a move that was never recognized internationally. Farah Pandith’s new book, How We Win: How Cutting-Edge Entrepreneurs, Political Visionaries, Enlightened Business Leaders, and Social Media Mavens Can Defeat the Extremist Threat, provides insights and observations often missed in the larger conversation about extremism. In a detailed chapter, condensed and adapted here, she investigates Saudi global influence—including imam training, free Saudi-translated Qurans, textbooks, destruction of human cultural heritage sites, and more—she saw in almost 100 countries while working for the U.S. State Department, and it dissects how and why Saudi Arabia has had an influence on identity for Muslims worldwide. In March 2010, while serving as the State Department’s first ever special representative to Muslim communities, a position created for me by Secretary of State Hillary Clinton to connect to and engage with Muslim millennials globally, I managed to get a visa to visit China even though the State Department’s Human Rights Reports regularly called out China for its treatment of its minority Muslim populations, and one ethnic group in particular, the Uighurs. China saw the Uighur issue as a domestic terrorism problem and our public highlighting of it as an affront. Still, an opportunity had arisen—and, working with our embassy, we designed a trip that would allow me to talk to young Chinese Muslims in Shanghai, Nanking, Kunming, and elsewhere. A highlight of the trip turned out to be a visit to a small town I had never heard of: Shadian, in the southern part of the country, about 150 miles from Kunming, where a population of Hui Muslims have lived for more than a millennium. My team and I drove for hours through lush countryside, cruising along dusty roads through villages replete with mom-and-pop storefronts and skinny white lampposts. Grocers sold fresh produce on the side of the road, their apples and leafy vegetables piled in perfect pyramids. Chinese-language signage promoted medical products. Our arrival in Shadian jolted me. Turning a corner, we came face-to-face with a glorious pedestrian boulevard with rows of majestic palm trees planted down the middle. At the end of those trees stood a huge, modern structure made of what appeared to be white marble and topped off by a light green dome. Fountains and two tremendous Jumbotron screens framed its entrance. I was mesmerized. What was all this? Then I glimpsed what seemed to be minarets flanking a prayer hall, and I knew: It was a mosque. The next day, a professor at a local Islamic university, an ethnic Chinese man who identified as Hui, graciously hosted me for lunch at his home. Throughout the meal, my host talked about Islamic education—how important it was for Muslim kids to learn about the religion and mix with other Muslim students, and how few proper Muslim universities existed. Throughout the meal, my host talked about Islamic education—how important it was for Muslim kids to learn about the religion and mix with other Muslim students, and how few proper Muslim universities existed. He also related that local youth sought to learn about Islam by studying in Persian Gulf countries. The clock on the television set was set for Mecca time as well as local time, and the television was tuned to a Saudi channel. Later, I toured the large mosque I had seen when I first arrived. It cost $19 million to build, funded entirely by private donations. My host seemed excited and proud to show the building to me. I asked him if Saudi money funded the mosque. He demurred. I was pretty sure I already knew the answer, so I asked if he could take me to see a more traditional mosque from this region of China. After much prodding, we got in the car for a short drive. When we got out, all evidence of the Gulf had vanished. I stood on a dirt road lined with modest houses and shops. My host pointed toward a compound surrounded by a tall wall covered over in painted terra cotta. “Here it is.” We proceeded through the entrance into a small courtyard, an oasis of fruit trees and flowerpots, the perfect site for prayerful contemplation. The mosque itself was much simpler than the Gulf-style mosque had been, made of wood and reflecting the themes of traditional Chinese architecture. The structure’s roof curled outward at its edges, while its open doorways permitted a view of the faithful praying inside. The religious services it housed conformed to what I was told was the ancient Sufi devotion mingled with traditional indigenous Chinese customs. Extremists such as the Islamic State and al Qaeda would like you to think about Islam as homogeneous or monolithic. As they exploit the global identity crisis among Muslim youth, they propound a very particular set of ideas about Islam and individual purpose—ideas that originate in the Gulf region and Saudi Arabia in particular, and that include a claim to represent the only true Islam. This form of Islam, called Wahhabism, is rigid, intolerant, highly dogmatic, puritanical, and contrary to liberal values. In recent decades, it has proliferated thanks to a very important sponsor: the Kingdom of Saudi Arabia. One can’t understand the global system underpinning extremism without surveying the pivotal role played by the Saudi government as well as private organizations and individuals within the kingdom. In recent decades, the Saudis have spent up to an estimated $100 billion spreading Wahhabism and perpetuating the notion that they are Islam’s caretaker. Their methods to persuade and influence run the gamut and include the funding of mosques, schools, textbooks, imams, imam learning centers and exchanges, cultural institutions around the world. The Saudis don’t simply want their extreme form of religious practice and belief to prevail. Religious forces in the kingdom, backed by the ruling family, want to destroy other, local traditions within Islam. To that end, they are rewriting history, erasing evidence of the past to favor their own narrative—a move that ideologically aligned extremists in many parts of the world have since copied. The relationship between the Saudis and extremism is not merely one of affinity. The Saudi government and Saudi individuals have directly supported terrorist groups in the Middle East and beyond. At the same time, quite paradoxically, the Saudi government has also served as a staunch ally in the fight against terrorism, sharing intelligence and military assets and helping to rein in terrorist financing. It also serves as a valuable counterbalance against Iran’s influence in the Middle East. Puzzling, isn’t it? Such is the canny strategy that has served the Saudis so well for so long. Given this history, the single most important step the United States can take toward eliminating extremism would be to combat the supremacy of Saudi ideology worldwide by cutting off the Saudi money that funds it. It’s vital, too, that America takes action to buttress local Muslim cultures and traditions. Otherwise, a generation of Muslims risks falling under the sway of a pernicious ideology that presents itself as authentic and absolute, and humanity risks losing a true and full record of its rich, Islamic past. Finally, the United States must address the ignorance of governments and individuals who quite innocently (perhaps) perceive the Saudis as Islam’s legitimate arbiters. Whether they realize it or not, they are part of the problem as well. My indignation over Saudi influence and homogenization only increased as I continued to travel as special representative to Muslim communities. I saw evidence of Saudi influence in Kazakhstan and Timbuktu, in Burma, and the Balkans. In Pakistan, Senegal, Guyana, and Indonesia, leaders told me that they understood Saudi Arabia’s true motives and were only superficially playing along. They didn’t want to accept Saudi money at all, but they had no choice. They were desperate for funds for schools, clothes, and even health care. They thought they could control the impact of Saudi ideology, preventing it from taking root in the culture. What emboldened them was the notion that Wahhabi traditions were foreign to their local culture and thus something that would never resonate with local people. They were wrong. As I saw myself, Islam was in the process of becoming homogenized, rendered more synonymous with Wahhabism and Arab culture generally. Rather than holding the Saudis responsible for redressing a longer-term, ideological problem, the United States has opted to secure their cooperation on short-term issues and to defer to them as the supposed arbiter of all things Muslim simply because they are the self-proclaimed custodians of Mecca and Medina. The United States has treated the Saudis the way it does the Vatican, assuming that they have the right to tell all Muslims what to do. But the Saudis don’t have this right. Ideology matters. The Saudis might be helping the United States fight terrorist groups, they might be helping to counter the influence and power of Iran in the region, and they might be buying billions of dollars of weapons systems and commercial products from America, but they are simultaneously taking actions that feed extremism and help it to grow. U.S. tolerance of their behavior signals to other Gulf countries—the United Arab Emirates, Qatar, and Kuwait—that they can get away with their own, lesser support for extremism. If we allow the Saudi-funded monolithic view of Islam to prevail, extremists will continue to find fertile ground for recruitment in local communities. Indeed, when the so-called Islamic State is defeated, other extremist groups will crop up in their place with equally harsh, unyielding ideologies, because the roots—the identity crisis that prompts youth to look outside their communities for answers—will remain. IS SEIZING THE OIL FIELDS THE ONLY WAY TO SAVE THIS COUNTRY? Afghan Peace Talks Shut-Down By Taliban Or Qatar? Was Timothy Leary a CIA Agent? Sri Lanka, Mossad, the CIA, drugs and arms dealers. How Do We Build the Resistance? The Most Moral Army In the World?